Situated 5 km from Great America Theme Park in Santa Clara Mariani's Inn & Restaurant welcomes guests to the restaurant and bar. The hotel has an outdoor pool and hot tub and guests can enjoy a meal at the restaurant. Free WiFi is provided and free private parking is available on site. Rooms also feature a flat-screen TV with cable channels and HBO film channels a refrigerator and a coffee machine. Hairdryers and ironing facilities are available at the front desk. All rooms include a private bathroom. A free hot country buffet-style breakfast is offered every morning. The bar and lounge are available with entertainment and happy hour. There is a restaurant onsite along with full room service. The outdoor patio has a barbecue for all your grilling needs. There is free limited hours shuttle service at the property. Meeting rooms and banquet facilities are available onsite. Levi's Stadium is 6 km from the property. 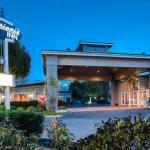 The nearest airport is Mineta San Jose International Airport 4 km from Mariani's Inn & Restaurant.